Metro Manila police director Guillermo Eleazar reiterated his appeal to the public to fully cooperate with authorities in connection with the “Liquid Ban” and the “No Food, No Drinks” policy at the MRT and LRT stations being strictly enforced following the recent bombings in Mindanao. 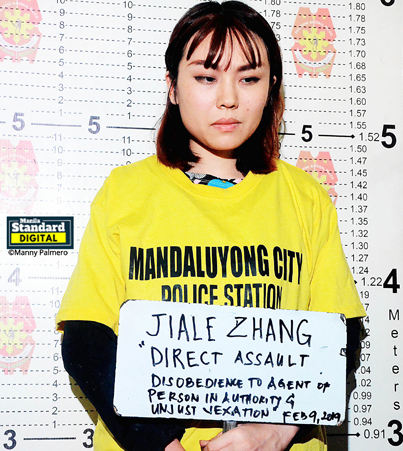 Eleazar made the appeal after members of the Mandaluyong City police arrested a Chinese national for throwing her taho snack at a duty police officer after being denied entry with her food at the MRT-3 Boni Avenue Station around 8:30 a.m. Saturday. Taho is snack food made of fresh soft/silken tofu with tapioca pearls and sweet flavoring. The foreigner was identified as Jiale Zhang, female, 23 years old, single, 1st year student at SOFA Design Institute taking Bachelor of Fashion and temporarily residing at 30P Axis Residences, Pioneer Street, Mandaluyong City. Investigation showed that the Chinese national was about to enter the station’s bag inspection area when the duty security guard checked her belongings and discovered a cup of taho inside a paper bag. The guard and the police officer identified as PO1 William Cristobal explained the policy not to bring any form of liquid, food or drinks inside the train but the foreigner insisted to bring in her snack. At the height of argument, the foreigner threw the snack food at the police officer’s uniform. This prompted the authorities to place the woman under arrest and brought to the Mandaluyong City-Police Community Precinct 5. At press time, the authorities were preparing charges of direct assault and disobedience to agent or person in authority to be filed against the foreigner. Eleazar said he recommended the strict implementation of the “No Foods, No Drinks Allowed” policy and the Liquid Ban at MRT and LRT as a preventive measure to any terrorist attack using liquid bombs. The National Capital Region Police Office also asked the Transportation department to implement a more comprehensive policy of preventing not only food and drinks, but also all forms of liquid products inside the terminals and trains to deter any liquid bomb attacks by terrorists or criminal elements. The agency granted Eleazar’s request and came up with a memorandum circular. The ban exempted train passengers carrying baby formula and breast milk, and baby drinking water provided that they are traveling with a baby or small child. Also exempted from the ban are all prescription and over-the-counter medications; liquids including water, juice or liquid nutrition or gels for passenger with a disability or life condition; life-support and life-sustaining liquids such as bone marrow, blood products, and transplant organs; Items used to augment the body and for medical and cosmetics reasons such as mastectomy products, prosthetic breasts, bras or shells containing gels, saline solution, or other liquids; and gels or frozen liquids needed to cool disability or medical-related items used by persons with disabilities or medical conditions. The memo circular also stated that the rules, including the exemptions, shall be done by the security guards in the terminals. “We are committed to continually improve conditions in the lives of our residents in Metro Manila so that everyone is safe everyday. The transport aspect and system in the daily routine of our residents is always an important element,” said Eleazar.